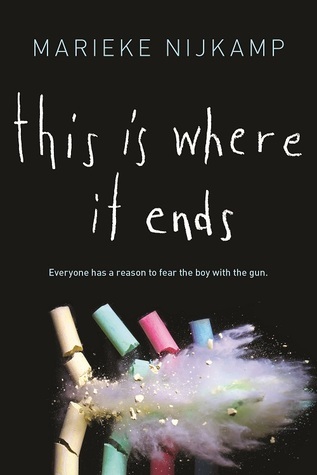 I'm not sure what we should expect from a book about a school shooting but I was floored by how upsetting Dutch author Marieke Nijkamp's this is where it ends is. The story, set in small town Alabama, is told in four students' voices and features a lot of flashbacks and real-time tweets. These devices do not help to flesh out characters, nor differentiate them from one another. I found myself reading the novel's beginning with impatience, wanting to get to the inevitable devastation. The story is tense--the body count adds up while we beg for it to end-- but the pacing is uneven. The 54 minutes of the shooting drags at times. The choices of the students are frustrating and the response from law enforcement seems sluggish. As in other disaster or tragedy stories, the motivating plot dominates the characterization. This is where it ends is hard to put down, but in a way that feels voyeuristic; I felt a little guilty about being sucked in to the drama. Each of Tyler's shots is such a senseless waste of life. And yet it was hard for me to really root for anyone in particular. If this is a topic that interests you, look into Hate List by Jennifer Brown and I Crawl Through It by A.S. King, which also address school violence.